The online store Lobbes.nl started 25 years ago in the toy market in The Netherlands. Four times a year a toy catalog is sent to their customers and a special edition for Christmas. In this catalog, they discover the newest and most popular toys. In the webshop, which welcomes over 225.000 visitors each month, the user will find over 20.000 different toy items. In addition to the toys, the visitor will also find a wide range of books, home accessories and office supplies on lobbes.nl. Lobbes expects to encourage and please every client with the toy that best suits their preferences or expectations. With such a wide product range been displayed, the visitor can easily get lost or distracted while browsing in such a vast range of products and might need help to find the right products in the webshop. The online store has had the approach of providing an organized overview of the products offered, so the visitor can easily find what he is looking for, making his browse journey more convenient. 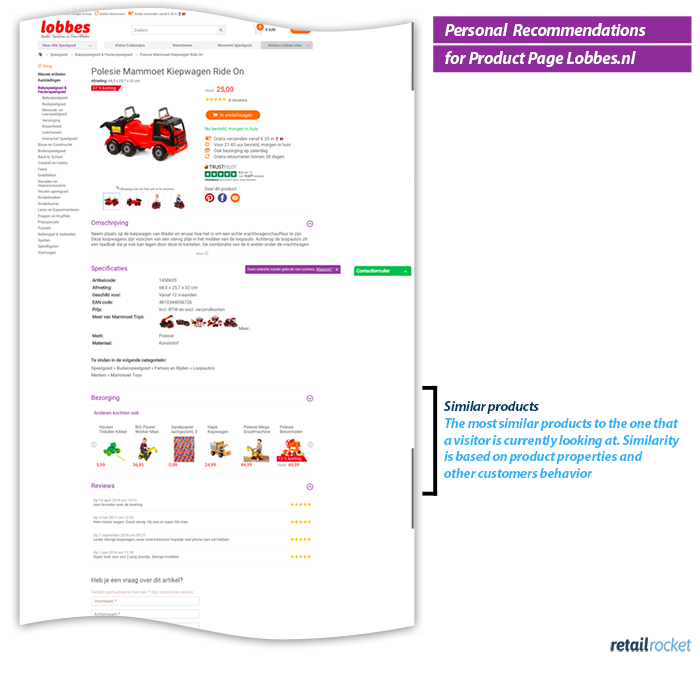 Retail Rocket provides personalized recommendations in real-time to help the user navigate the online shop. 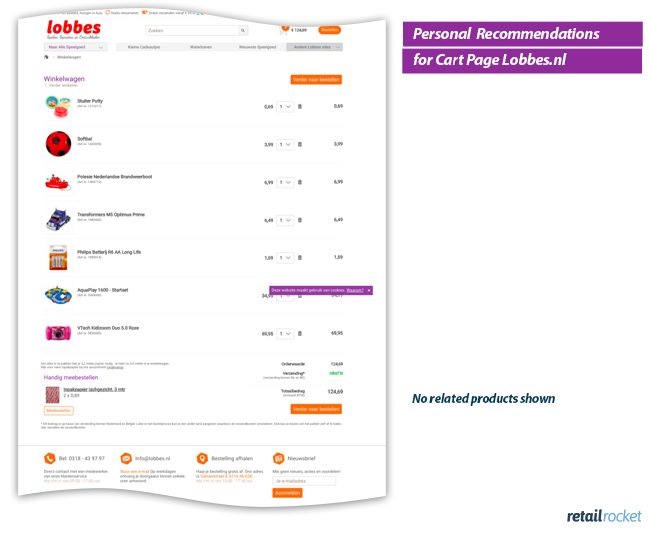 These recommendations automatically reflect any changes in behavior, assisting Lobbes’ visitors to find the products they need quickly and with little effort. By delivering a more structured overview of the website, with product recommendations, the conversion rate increases. An A/B test has been performed on two parts of the Lobbes webshop. 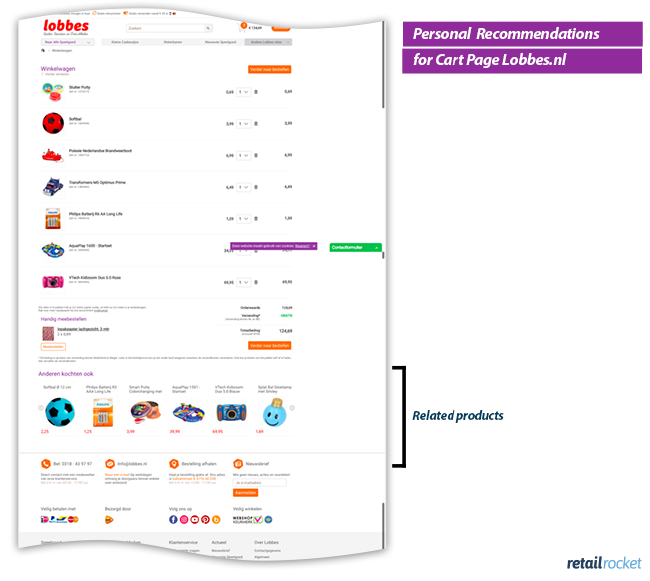 In this case, we study the outcome of Retail Rocket’s implementation of their personal recommendation blocks on both cart and product page of the Dutch webshop Lobbes.nl. Retail Rocket offers more than twenty unique personalization scenarios for every step in the customer journey. Each step can have a distinguished effect on the key performance indicators of the webshop. To find out which of the twenty scenarios was the most effective for this online store an A/B test was performed within 5 groups. All visitors of Lobbes.nl were randomly split into these segments. 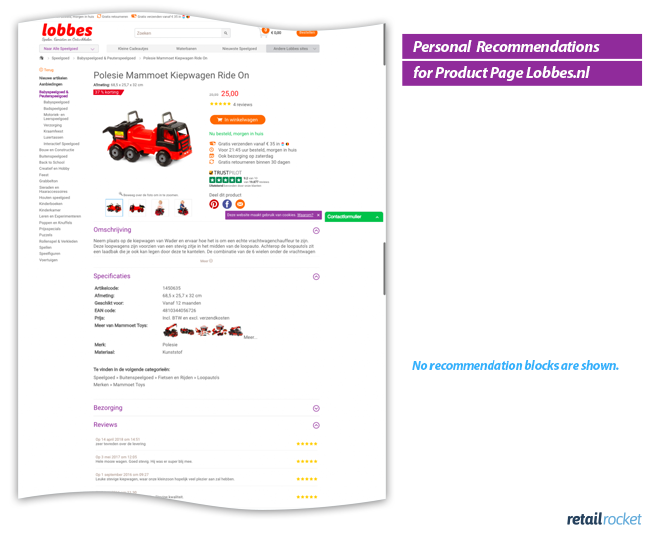 According to the product shown to the user, recommendations are displayed below the product that is being viewed. 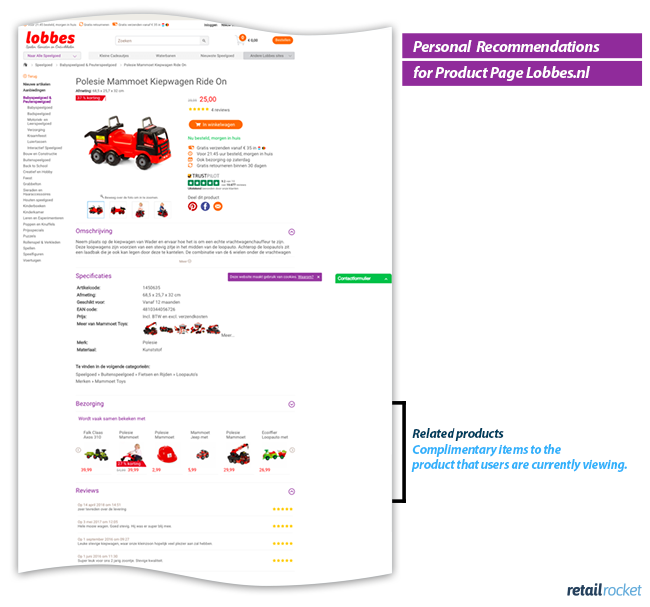 The recommendations are similar to the products the visitor is viewing. 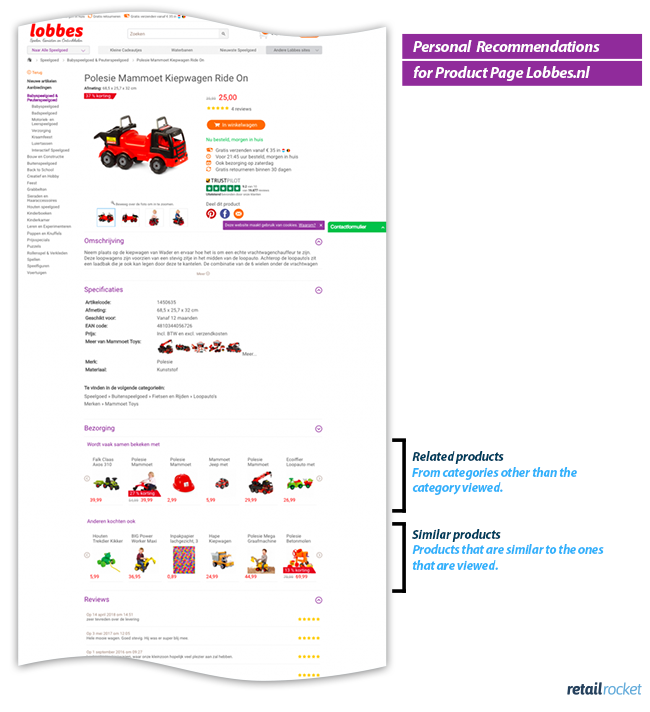 Based on the product that the visitor is looking at, related products from other categories are shown. 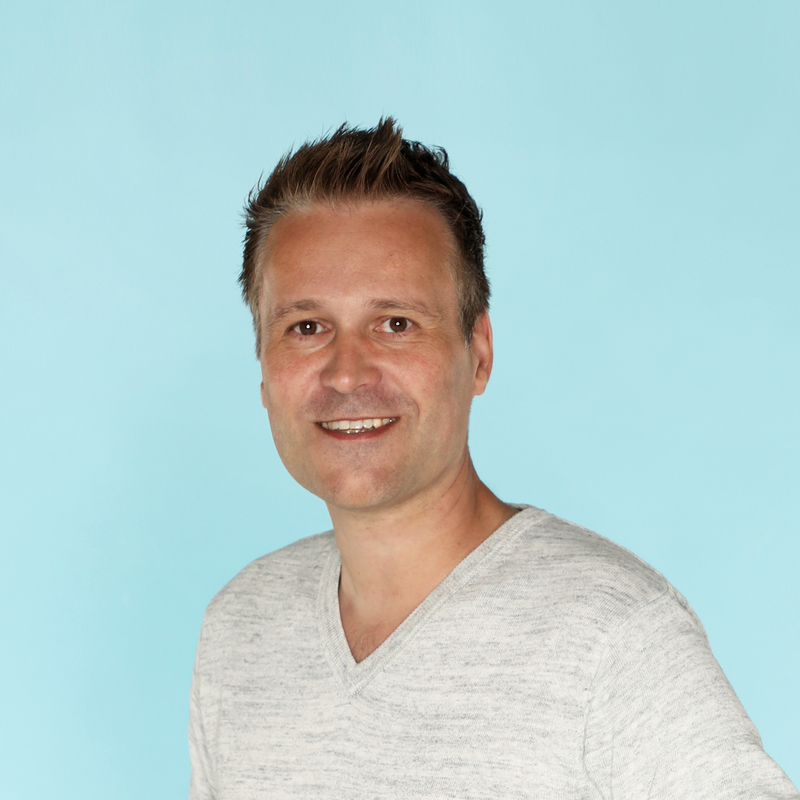 The goal of the experiment was to uplift revenue on the product page of the online store Lobbes.nl. The implementation of the personalized recommendations gave the following results. The (shopping) cart page on an online retailer’s site facilitates the purchase of a product. The visitor typically checks the products that are being ordered and then proceeds to the checkout page where the total order is placed and confirmed. 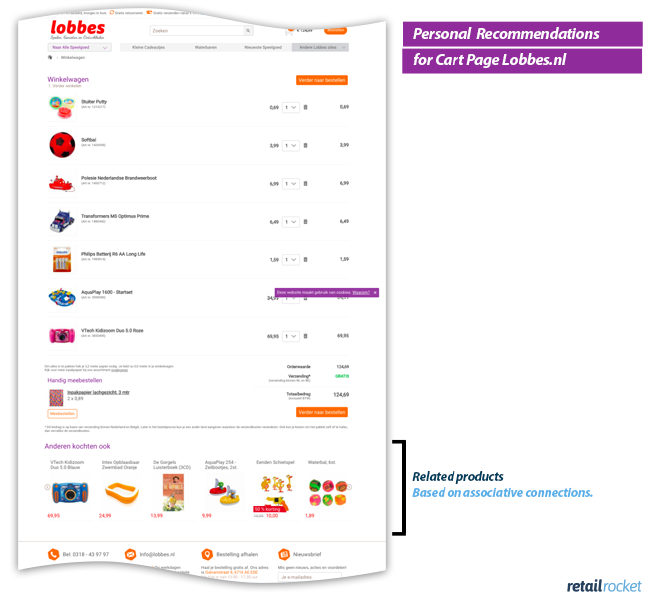 Before the visitor ends his journey, Retail Rocket’s related product recommendations are displayed also in the cart page. All the Lobbes.nl cart page visitors were split into four segments in real-time. Retail Rocket technology has provided a positive impact on the generated revenues at Lobbes.nl. On the product page, according to the data from the A/B-test, the most effective was «Two blocks: related products and similar products». It increased the conversion rate of target visitors by 17,7%, the revenue had a boost by 29,6%, and the Average Order Value increased by 10,2%, with a statistical significance of 99%. On the cart page, the most effective was the block with «related products from categories different from the category of the current product». This functionality increased conversion by 5,9% and it also boosted the revenue by 5,4%. At Lobbes.nl we had been looking for a good solution for website personalization for some time. We believe that making good product recommendations and offering the right alternatives for sold-out items would enormously contribute to a pleasant shopping experience for the customer. Retail Rocket provides, through their algorithms, a smart and fast solution, which is also easy to implement. Even after we have started with the personalization blocks, Retail Rocket appears to be an active party that continues to research, for example by a / b testing, whether there are any points for improvement. This makes it a pleasant party for Lobbes.nl to cooperate with and a party that offers an extremely good personalization solution.